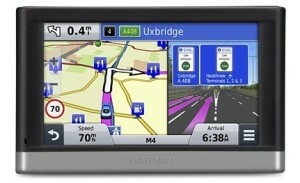 The Garmin nuvi 2597LMT sat nav model is among one of the best selling sat navs, it comes with free lifetime map updates, free lifetime traffic alerts and Bluetooth are just a few of the benefits this sat nav offers giving you good value for money. What can get quite confusing however is the Garmin nuvi model names, there are so many variations of each model, you can usually choose what screen size you require, what part of Europe you want to be covered for, plus other features. When you select what you require the model name changes each time. 5 inch high resolution touchscreen. 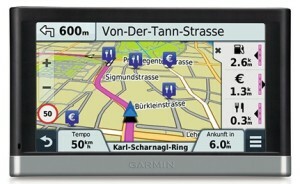 Preloaded street maps for 45 European countries including UK and Ireland. Bluetooth enabled for hands-free calling. Land guidance shows you the correct lane you need to be in. Speed camera alert tells you when you are approaching a fixed speed camera. Points of interest enables you to find places or services without having to enter the address. Voice activated navigation allows you to simply stat your destination while keeping your hands on the wheel. Real navigation system uses recognisable landmarks to direct you. Compatible with android smartphones via smartphone link which is a free app. The high resolution 5 inch screen has the “pinch and zoom” feature and the orientation can be switched to either horizontal or vertical. The lifetime map updates allows you to keep on top of changing or new roads being built, new maps are available to download 4 times a year at no extra cost. Traffic alerts will prompt you in advance so you can avoid incidents and congestion, whether it’s caused by road works, an accident or rush hour traffic. You’ll be notified of where the incident or congestion is, how long delays are and you’ll also be offered an alternative route. A lot of newer vehicles will come equipped with Bluetooth, but if it doesn’t then the Garmin nuvi 2597LMT has a built-in integrated microphone and speaker to allow you to make phone calls. This will clearly show what lane you need to be in or what exit you need to take. Voice prompts with brightly coloured arrows will assist you ensuring you take the correct route with confidence. The sat nav is preloaded with places or services nearby, whether it’s a restaurant, bank, petrol station you can simply use the voice recognition feature by stating what place or service you’re after and your sat nav will take you there. This feature allows you to simply stat the destination you require, the device will then respond and direct you to your stated destination. The real navigation system will give you directions by using recognisable landmarks, buildings and traffic lights rather than road names as it can be difficult to see what road you’re on sometimes. So instead of the sat nav telling you to turn left at a certain road it’ll say turn left after the museum. The voice used to give directions will be more comforting as it’ll give you directions like a real person would, rather than the typical “in 800 yards take a left”. The two features in particular which make the Garmin nuvi 2597LMT sat nav worth its money is the free traffic updates alert and speed camera alerts. Both of these extremely handy features comes included in the price, for the TomTom sat navs which doesn’t include these features they charge a yearly fee which is not cheap either. On top of the two features mentioned above, if your vehicle doesn’t have Bluetooth then it’s handy that this comes equipped with a microphone and speaker enabling you to make hands-free phone calls, although the quality is not great. If you do minimal driving and don’t require such features then a good alternative to consider would be the Garmin nuvi 52LM which still has a clear 5 inch touch screen and is also quite a bit cheaper.